The three (not so little) pigs snuffling around as the sun goes down on a beautiful crisp Sunday. I’m sure tomorrow is going to be one of my least happy days on this journey, but this is what it’s all been leading to. Without this part, the rest is obsolete. 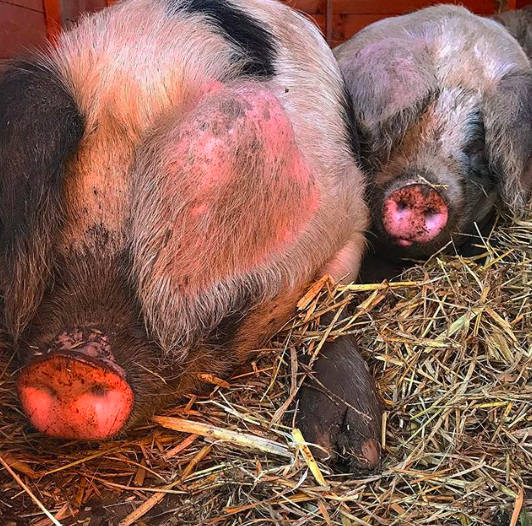 Without all the learning and fun and joy from these tiny piglets, that have grown into hilarious pigs, I would not be experiencing all the feelings that I am feeling right now. And these are the right feelings to have. It shouldn’t be easy. I think I’d rather feel this emotional, this much care and love, every single time, than become hardened to the process and forget that these are living, sentient beings. Because it is all too easy to forget that when you sit down to eat a piece of meat. My words can’t begin to do justice to the multitude of emotions I’m feeling tonight, so I won’t try. But they were stress free, happy and loved right to the end. Today hasn’t been a great day, I’ve spent most of it wandering around knowing I need to get down on paper everything I’m feeling while it’s raw so I don’t forget it all, but also wanting to just sit on everything a bit more. I’m so proud of my family, who have all played such an important part in this journey and all pulled together yesterday to get the job done. Everyone had their designated jobs. Some incredible manoeuvring work from @iainyoung9 driving the trailer - I would have been utterly hopeless at that, especially in the circumstances. Mummy @mysecretfeasts for keeping a fantastic sense of practicality, perspective and organisation to proceedings. And my incredible brother, Fraser, for helping me get the pigs in and out of the trailer and for getting himself so well mentally prepared for yesterday since day one. We also had the lovely Lizzie from @bicbim with us yesterday, to experience the day with us - thank you for being so compassionate and supportive throughout the day. Lizzie took this picture when I introduced her to the pigs and spent some final time with them, giving them lots of head rubs, belly tickles and treats. But I still feel an overwhelming sense of guilt and sadness. I am so grateful to everyone who has sent messages of support, love and kindness, and have made the last week that little bit easier. Just think about how much their lives have given to this world...they were no ordinary pigs! They were your pigs, and the life that you gave them has taught you and others so much. They may be at the end of their lives but what they leave behind has changed your life forever for the better. Not many pigs make any impact on the future of our lives but these ones will. Enjoy your last moments with them and focus on feeling proud of how you have raised them, the life they have enjoyed, the people they have touched and the hundreds of pigs they will be a part of saving and giving better lives to. Everything you have done is a positive move towards a better future for farm animals. Cosy toes. This shed used to belong to our rescue donkey Basil and has sat unused in the orchard since he died. After opening up the enclosure for the piggies (after worrying about all the mud they were having to put up with) I decided to open up this little straw filled shed for them to explore too. For their last few nights they all snuggled up in here together rather than heading back to their arc which was surrounded by the mud swamp. Although it was still lovely and clean and dry in the arc, they obviously preferred this new area we had made for them and loved this cosy new snoozing spot. For me this shows I was right to trust my instincts. I didn’t feel they were as happy as they could be with the mud getting so swampy. I had the option to move them with a bit of fencing DIY, so I did. They did manage to break their way into the chicken enclosure and crash through the electric fence, but we reasoned they’d got hungry with the sudden snap of cold weather. The chickens were fine, just slightly miffed that their food and feeder had been demolished. We re-fenced and got them some more veggies. And all was well again. This was quite clearly the preferred snuggle spot, and I’m so pleased I listened to my instincts and knew them well enough to know they were less happy than they had been. Having more of a connection with them has definitely made this experience harder, but I’m so pleased I did, in order to be aware of their needs and do everything in my power to keep them happy. The three little pigs, back when they really were little. It’s nearly been a week since they’ve gone, and now the focus is on what we are going to be making from them. It might seem somewhat heartless to be posting these pictures of them as piglets and then discussing sausage and bacon options but this is the reality of the process. I’m nervous about the butchery next week. Although we didn’t name the pigs they were very distinctive from their spots and the patches of black and pink skin on their ears. I’m worried I’m going to know who’s who when I see them hanging up by their legs. I’m worried I’m not going to deal with it very well. But I also want to do them justice. They died so we can eat them, and I will do everything I can to make sure we use every last bit possible. I’m just not sure how I am going to feel about eating them myself just yet. Part of me thinks as soon as I see them the circle will be complete and the pride and satisfaction of giving them such great lives will outweigh the guilt and sadness. The other part of me is still struggling to sleep and feeling awful about the whole thing and wondering whether I want to eat meat at all. But that’s okay. That’s why we came on this journey - to face up to the big picture and force ourselves to ask the questions that often we’d rather ignore.